The Bolsheviks (Russian: Большеви́к IPA: [bəlʲʂɨˈvʲik], derived from bolshinstvo, "majority") were a faction of the Marxist Russian Social Democratic Labor Party (RSDLP) which split apart from the Menshevik faction at the Second Party Congress in 1903 and ultimately became the Communist Party of the Soviet Union. The Bolsheviks seized power in Russia during the October Revolution phase of the Russian Revolution of 1917, and founded the Soviet Union. 3 Derogatory Usage of "Bolshevik"
Bolsheviks (or "the Majority") were an organization of professional revolutionaries under a strict internal hierarchy governed by the principle of democratic centralism and quasi-military discipline, who considered themselves as a vanguard of the revolutionary proletariat. Their beliefs and practices were often referred to as Bolshevism. Over time, the principle of "democratic centralism" became less democratic and more centralized. The party was founded by Vladimir Lenin, who also led it in the October Revolution. In the Second Congress of the RSDLP, held in Brussels and London during August 1903, Lenin advocated limiting party membership to a small core of professional revolutionaries, leaving sympathizers outside the party, and instituting a system of centralized control known as the democratic centralist model. Julius Martov, until then a close friend and colleague of Lenin's, agreed with him that the core of the party should consist of professional revolutionaries, but argued that party membership should be open to sympathizers, revolutionary workers and other fellow travellers (спутники or sputniks). The two had disagreed on the issue as early as March-May 1903, but it wasn't until the Congress that their differences became irreconcilable and split the party (Israel Getzler). Although at first the disagreement appeared to be minor and inspired by personal conflicts (e.g. Lenin's insistence on dropping less active editorial board members from Iskra or Martov's support for the Organizing Committee of the Congress which Lenin opposed, the differences quickly grew and the split became irreparable). From 1907 on, English language articles sometimes used the term "Maximalist" for "Bolshevik" and "Minimalist" for "Menshevik", which proved confusing since there was also a "Maximalist" faction within the Russian Socialist-Revolutionary Party in 1904–1906 (which after 1906 formed a separate Union of Socialists-Revolutionaries Maximalists‎) and then again after 1917 ("the term 'Maximalist' rather widely used as a translation for Bolshevik' is historically false"). The lines between the Bolsheviks and the Mensheviks hardened in April 1905 when the Bolsheviks held a Bolsheviks-only meeting in London, which they call the Third Party Congress. 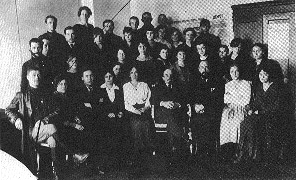 The Mensheviks organized a rival conference and the split was thus formalized. The Bolsheviks played a relatively minor role in the 1905 revolution, and were a minority in the St. Petersburg Soviet of Workers' Deputies led by Trotsky. The less significant Moscow Soviet, however, was dominated by the Bolsheviks. These soviets became the model for the Soviets that were formed in 1917. As the Russian Revolution of 1905 progressed, Bolsheviks, Mensheviks and smaller non-Russian social democratic parties operating with the Russian Empire attempted to reunify at the Fourth (Unification) Congress of the RSDLP held at Folkets hus, Norra Bantorget in Stockholm, April 1906. With the Mensheviks ("The minority") striking an alliance with the Jewish Bund, the Bolsheviks (ironically) found themselves in a minority. However, all factions retained their respective factional structure and the Bolsheviks formed the Bolshevik Center, the de-facto governing body of the Bolshevik faction with the RSDLP. At the next, Fifth Congress held in London in May 1907, the Bolsheviks were in the majority, but the two factions continued functioning mostly independently of each other. With the defeat of the revolution in mid-1907 and the adoption of a new, highly restrictive election law, the Bolsheviks began debating whether to boycott the new parliament known as the Third Duma. Lenin and his supporters Grigory Zinoviev and Lev Kamenev argued for participating in the Duma while Lenin's deputy philosopher Alexander Bogdanov, Anatoly Lunacharsky, Mikhail Pokrovsky and other argued that the social democratic faction in the Duma should be recalled. The latter became known as recallists ("otzovists" in Russian). A smaller group within the Bolshevik faction demanded that the RSDLP central committee should give its sometimes unruly Duma faction an ultimatum, demanding complete subordination to all party decisions. This group became known as "ultimatists" and was generally allied with the recallists. With a majority of Bolshevik leaders either supporting Bogdanov or undecided by mid-1908 when the differences became irreconcilable, Lenin concentrated on undermining Bogdanov's reputation as a philosopher. In 1909 he published a scathing book of criticism entitled Materialism and Empiriocriticism (1909), assaulting Bogdanov's position and accusing him of philosophical idealism. In June 1909, Bogdanov was defeated at a Bolshevik mini-conference in Paris organized by the editorial board of the Bolshevik magazine "Proletary" and expelled from the Bolshevik faction. With both Bolsheviks and Mensheviks weakened by splits within their ranks and by Tsarist repression, they were tempted to try to re-unite the party. 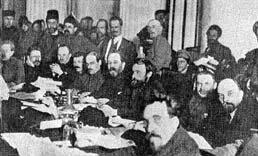 In January 1910, Leninists, recallists and various Menshevik factions held a meeting of the party's Central Committee in Paris. Kamenev and Zinoviev were dubious about the idea, but were willing to give it a try under pressure from "conciliator" Bolsheviks like Victor Nogin. Lenin was adamantly opposed to any re-unification, but was outvoted within the Bolshevik leadership. The meeting reached a tentative agreement and one of its provisions made Trotsky's Vienna-based Pravda a party-financed "central organ." Kamenev, Trotsky's brother-in-law, was added to the editorial board from the Bolsheviks, but the unification attempts failed in August 1910 when Kamenev resigned from the board amid mutual recriminations. The factions permanently broke off relations in January 1912 after the Bolsheviks organized a Bolsheviks-only Prague Party Conference and formally expelled Mensheviks and recallists from the party. As a result, they ceased to be a faction in the RSDLP and instead declared themselves an independent party, which they called RSDLP (Bolshevik). Although the Bolshevik leadership decided to form a separate party, convincing pro-Bolshevik workers within Russia to follow suit proved difficult. When the first meeting of the Fourth Duma was convened in late 1912, only one out of six Bolshevik deputies, Matvei Muranov, (the other one, Roman Malinovsky, was later exposed as a secret police agent) voted to break away from the Menshevik faction within the Duma on December 15, 1912. The Bolshevik leadership eventually prevailed and the Bolsheviks formed their own Duma faction in September 1913. Bolsheviks with Lenin in the middle. Russian Revolution of 1917, also known as the Bolshevik Revolution. ↑ Derived from men'shinstvo ("minority"). The split occurred at the Second Party Congress in 1903. ↑ Leon Trotsky frequently used the terms "Bolshevism" and "Bolshevist" after his exile from the Soviet Union to differentiate between what he saw as true Leninism and the regime within the state and the party which arose under Stalin. However, "Bolshevism" today is commonly associated with the Stalinist regime which existed in the Soviet Union. Étienne, Antonelli. Bolshevik Russia. translated by Charles A. Carroll. A.A. Knopf, 1920. The Practice and Theory of Bolshevism, available for free via Project Gutenberg by Bertrand Russell, November 1920. This page was last modified on 15 June 2016, at 19:26.